Before getting into bed on the third night of the cruise I opened the curtains and blinds. Sleeping with the curtains open I usually wake up with the rising sun, and I desperately wanted to see dawn on the Nile. The Oberoi Philae was docked at Esna, and for a moment I just stood and watched a few dogs roaming the deserted streets. Despite an early start that day to beat the heat and crowds in the Valley of the Kings and other ancient sites on the West Bank of Luxor we also had a late night. Mr Eldin, the boat manager, told us the Philae would be setting sail at about four in the morning so that we could arrive in good time for a morning visit to the Temple of Horus at Edfu. Several hours later I awoke to the view from my cabin captured in the photograph above. I do not remember when and where I last saw water that still. Even as the prow of the ship cut through the water the wake retained the appearance of satin cloth. Obviously my sleep had not been disturbed by the starting of the boat’s engines, it was at least three hours since the scheduled sailing. And clearly I had missed the rising sun. It then dawned on me my cabin faced west and I was never going to see the rising sun from my bed. Not to be disappointed, the following morning I woke earlier, dressed and took my camera up to the deck. And from there I watched the sun rise on the Nile (below). 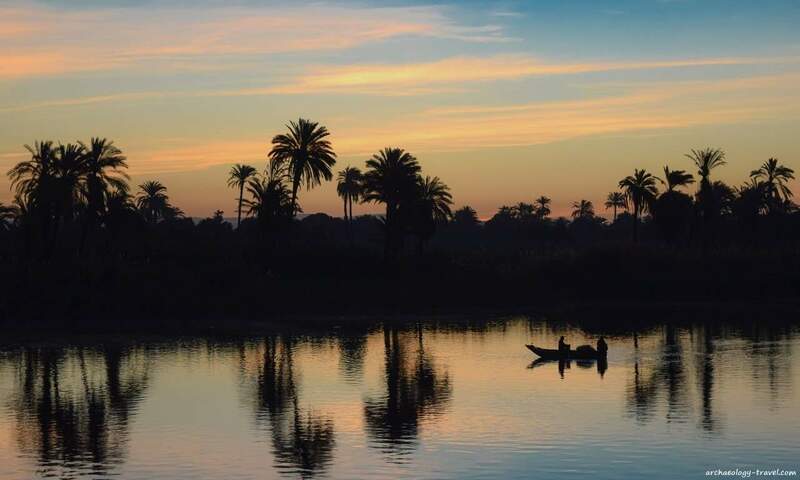 Palm trees on the east bank of the Nile River and two men in a wooden canoe provide an evocative silhouette for the rising sun. 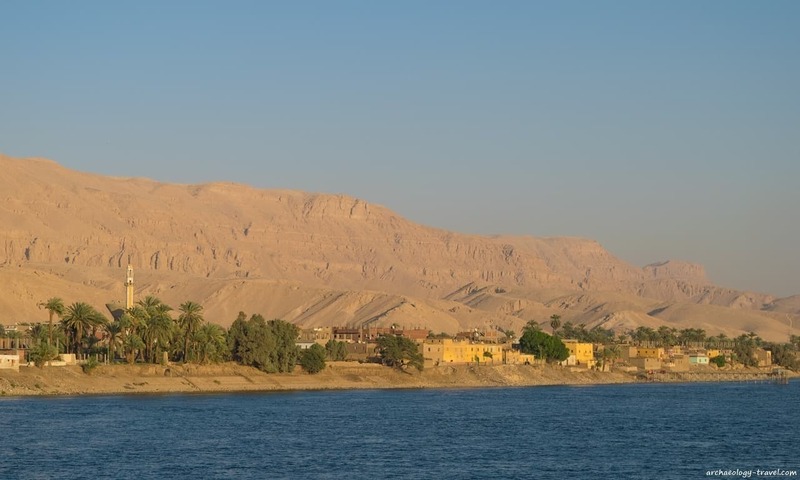 Cruising the Nile is a truly remarkable adventure, and I have enjoyed this experience twice. For this my second cruise I was a guest of the Oberoi Group, Cyplon Holidays and EgyptAir, and it was every bit as memorable as my first nearly twenty years ago. 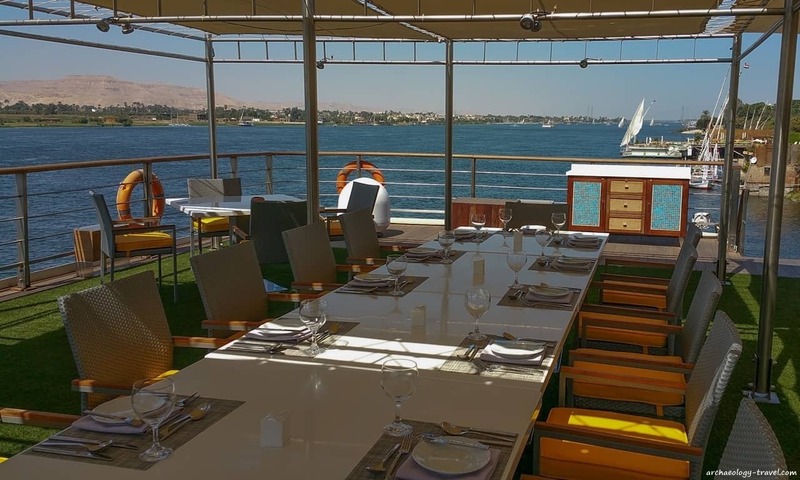 Whether you are taking time out in your cabin, soaking up the sun on the deck, or trying out the facilities on board the ship, the ever-changing view as your boat cruises up or down the Nile is sure to captivate you. 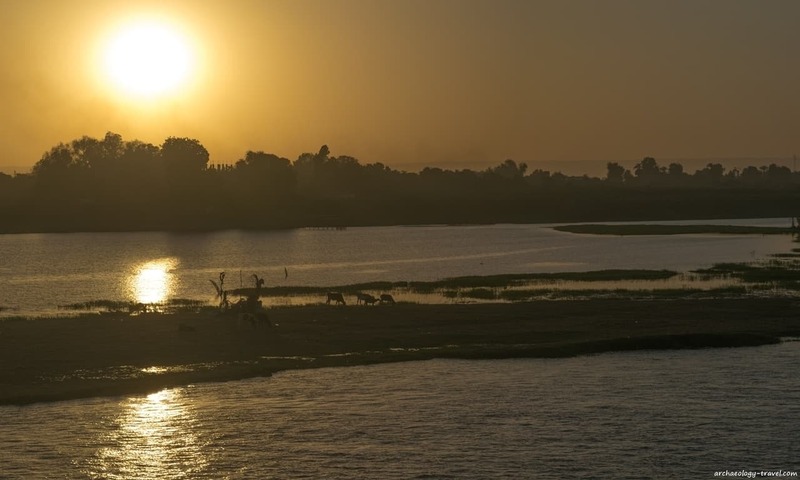 One of the reasons why Nile cruises are so popular, and have been for well over a century, is because of what lies in the hills and desert beyond the banks of the Nile. From as early as the end of the 18th century scientific expeditions reported on the ancient wonders of Egypt. And archaeological discoveries made since then, most notably the opening of Tutankhamun’s tomb in 1922 – which still tantalises archaeologists in 2016, have added many more reasons to visit. Top right and clockwise: the reconstructed pyramid-tomb of Sennedjem at Deir el-Medina; the first pylon at Medinet Habu – the mortuary temple of Ramesses III; Tarek Elshimy explaining the inscriptions in the temple of Isis on the island of Philae; the temple of Isis on Philae island. 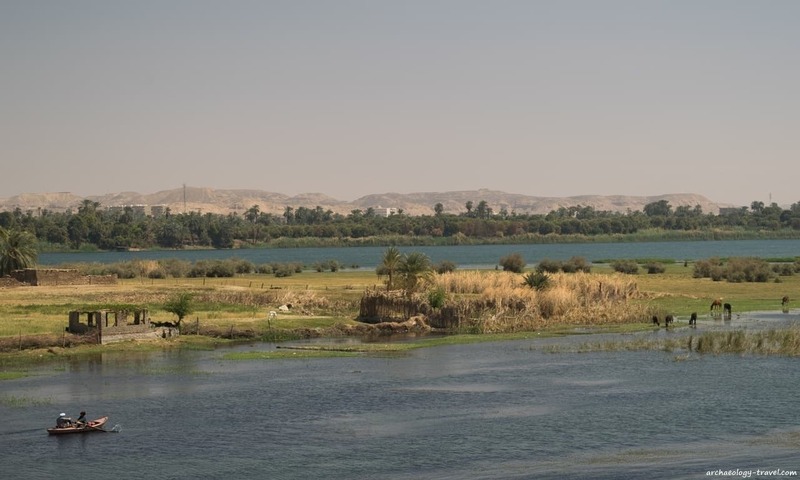 Choosing the Oberoi Philae, you get to see some of the best archaeological sites between Luxor and Aswan. There are in fact two itineraries to choose from. The five-day (four night) cruise sails between Luxor and Aswan, and includes the Valley of the Kings and King Tutankhamun’s tomb, the temples of Luxor and Karnak in Luxor, the twin temple in Kom Ombo, the temple of Horus in Edfu, and the temple of Isis on the island of Philae. As an introduction to the archaeology of Egypt, these are some of the best site – the temple at Edfu is the best preserved of its kind. 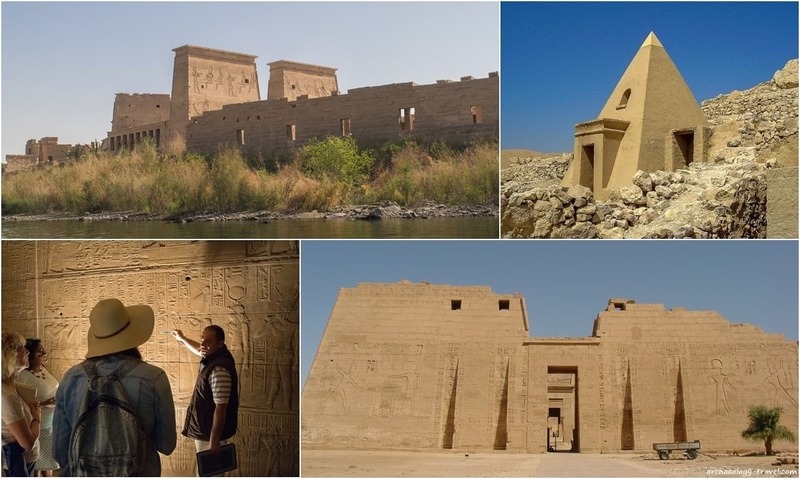 For those who want more archaeology, there is a seven-day (six nights) cruise that allows for an optional visit to Abu Simbel in the south, and sails north of Luxor to visit the temples at Qena and Abydos. If you have a preference, both itineraries are available for sailing up or down the Nile, from Luxor to Aswan or Aswan to Luxor respectively. What I liked was the relaxed nature of the itinerary. 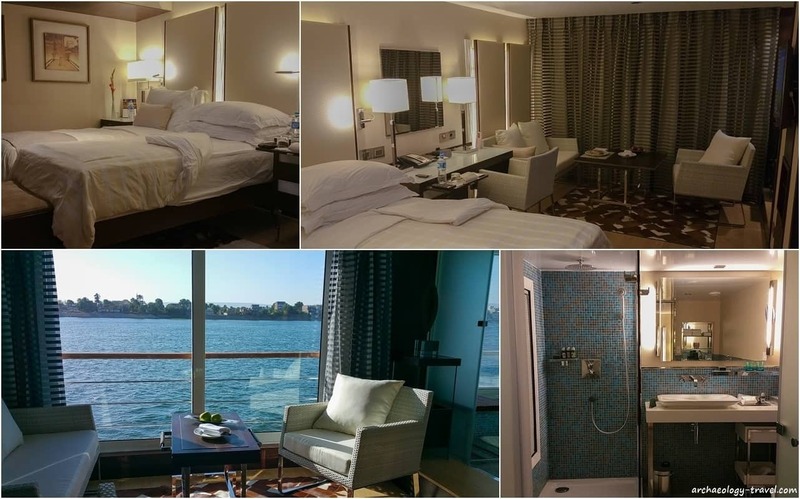 Not only do you get to visit some of the best sites in Upper Egypt, time spent sailing between these sites allows you to make good use of the facilities on board the ship, including a temperature controlled pool, a gym and a spa. Included in the price for each person is an hour massage by a professional masseuse. My recommendation: of course not every site in Luxor or Aswan is included. As both towns have excellent hotels, why not extend your stay with a few day on land. Depending on your level of interest, five days in Luxor will not be a disappointment. And from there you can even take a day trip to Cairo. From years of experience, and certainly for me, what makes or breaks a visit to archaeology sites is the guide. Whether this is a person, an audio guide or a book/leaflet. There are no audio guides for the sites in Egypt, and I dislike walking around and reading. All the Nile cruises provide guides, but while all guides are required to be professionally accredited, not all guides are equal. The Oberoi have obviously taken great care in choosing their guides. Our guide was the best! Come back to the website (or sign up for a newsletter below), as I will be publishing an interview with Tarek Elshimy soon. On the frontpage of the Oberoi Group’s website you will read that the company was voted the World’s best hotel brand for 2015 by readers of Travel + Leisure. 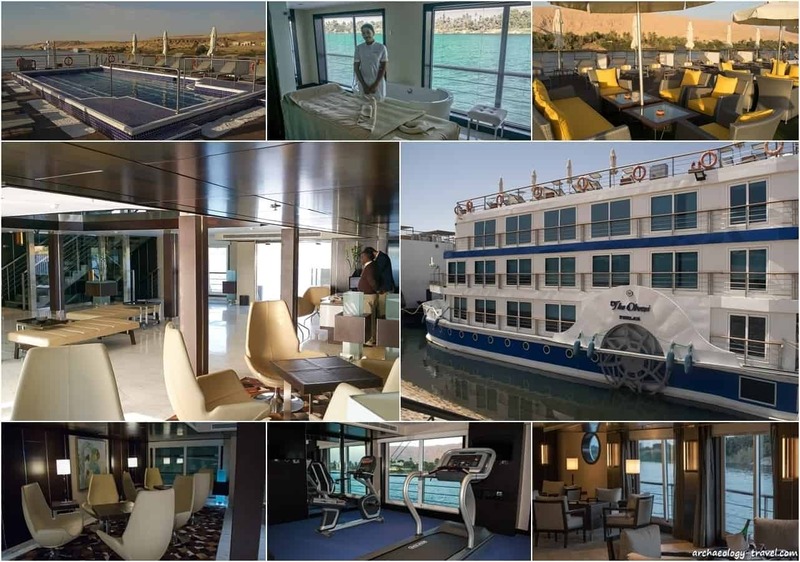 The website also boasts that the Philae is the most luxurious cruise ship on the Nile. High expectations indeed! While I have only experienced a 3* ship on the Nile, I can say that the Philae stands above some 5* hotels I have stayed in. And I am not in the least bit surprised by the accolades. Just a few of my photographs, have a look at the website for more professional photographs and all the details about the boat. The website does an excellent job of accurately representing the features of the boat, as well as the services and facilities available (there is a link at the bottom of this page). A few years ago the Oberoi Philae underwent a total refit – what was a 50 cabin cruiser now has 22 standard cabins with two suites. Ours was a relatively small party, but even if the boat is fully booked, that is not an overwhelming number of fellow passengers for a quiet and more relaxing trip on the Nile. Today there are not that many ships cruising the Nile, back when I took my first trip there were around 300. Nonetheless, space for docking the ship is still limited. To resolve this boats pull up alongside each other, sometimes six deep. That is five boats you have to traipse through getting on and off. Like many of the luxury cruise ships, the Oberoi Philae gets its own dock at the various stops. Besides the many obvious differences, this is certainly one thing that struck me about being on a 5* boat as opposed to a 3* one. Good to know: the Oberoi do not operate with a minimum number policy – if you are the only guests booked in for a cruise, the ships sails … with you, your booked holiday does not get cancelled. The cabins are really quite spacious, and the suites even bigger – larger than some apartments I have lived in! All spotlessly clean and tastefully decorated, and each has the features and facilities you would expect from a 5* hotel, including a well stocked mini bar. Good to know: although there are no activities on board for children, the cabins do have interleading doors that can be unlocked if necessary. There is also a modest library of DVDs. My Tip: if you want to see the sun rise from your bed, make sure to ask for an east-facing cabin. That is on the right hand-side of the ship if you are sailing from Aswan to Luxor and on the left if you are doing a Luxor to Aswan trip. Or starboard and port respectively if you are not nautically challenged like me. After archaeology, I love cooking and have an adventurous palette. And so I greatly enjoyed the mix of Western, Indian, Asian and Middle Eastern cuisines served to us. 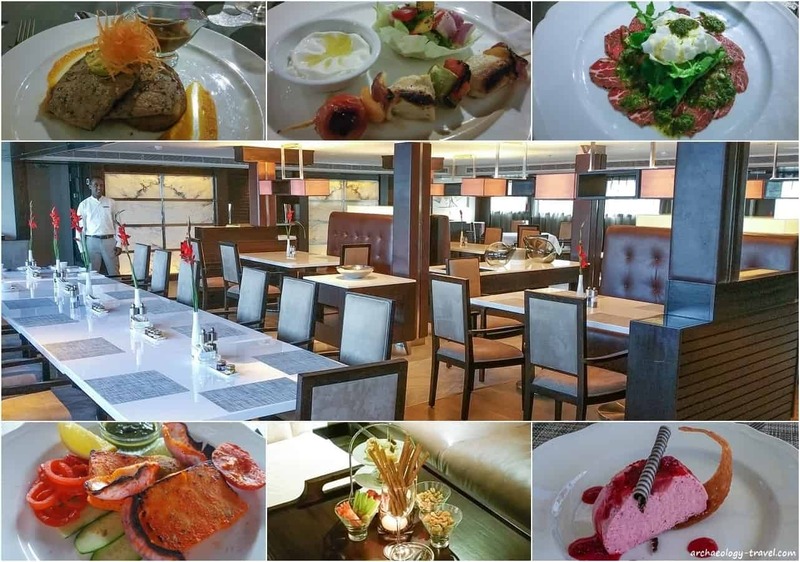 Each day the menus changed, with a number of dishes for each course to choose from, including vegetarian and vegan options. Evening meals are served in the dining room, and lunch is served on the upper pool deck. For breakfast you have the choice of the usual Western-style options, as well as a typical Middle Eastern breakfast. For some reason I had never tried tried paneer, a fresh cheese from south Asia. But a friend of mine loves it. So when I saw Tandoori paneer on the menu, I just had to have it. Tandoori is after all my favourite method of cooking from southeast Asia. Thankfully, it appeared on the menu twice! As I was part of a group we all ate together, understandably. Unlike other cruise ships, guests are not normally required to eat at the same time; meals are served in a generous time period. Good to know: while meals are included in the cost of the cruise, beverages are extra. And wine, beer and spirits are available. The dress code for dinner is smart, so no jeans, sport wear, sports shoes; and men are asked to wear long trousers with closed shoes. This cruise was part of my fourth visit to Egypt, and my second boat trip on the Nile. 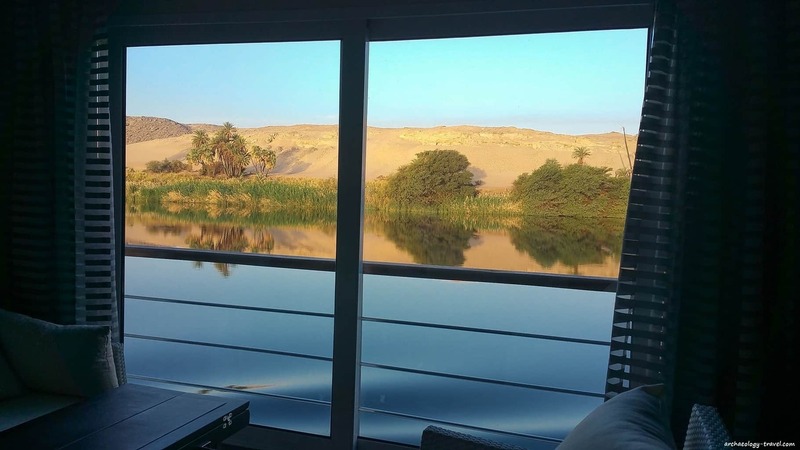 Even though I have stayed in 5*, luxury accommodation in Egypt before, the Oberoi Group’s luxury Nile cruise surpassed my previous Egyptian experiences. Again, however, this trip confirmed what I have always thought when visiting Egypt. Not to devalue the staff of the Oberoi Philae in any way, but the generous and heartfelt hospitality I just encountered is what I have come to expect when visiting Egypt. From the moment we boarded our EgyptAir flight in London, to our welcome aboard the ship in Luxor some seven hours later, to every time we returned from another enchanting site visit, the hospitality you receive in Egypt is in my opinion truly exemplary. Although my four days on this cruise was complimentary, I assure you the sentiments expressed above are entirely my own and have not been prescribed or vetted in anyway. Full Specs: for all the details about the Oberoi Philae consult the website. Follow the Oberoi Philae on Facebook and Twitter. Getting there: Luxor and Aswan have large airports, and EgyptAir has international and domestic flights to both destinations. Most, if not all packages include airport transfers. Follow EgyptAir on Twitter, Facebook and Instagram. Booking: book a cruise on the Oberoi Philae on the Oberoi Group’s website. I loved the Oberoi Philae! great review, very comprehensive. I get seasick so I’ve never done a cruise before. I didn’t need any of the tablets at all. I felt the boat barely move which was great. Shobha, You raise a point I had forgotten all about. I have had the odd bout of seasickness before – the worse being on the ferry to Delos from Mykonos. It was only being able to actually see ruins that got me there :) While on the Philae I did not even think about seasickness at all. It really is that smooth! What travel agent did you book it? Book directly with Oberoi Hotels, the link is in the grey box above ‘Travel Essentials’.